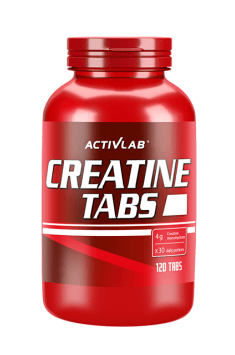 Creatine Tabs from Activlab is a dietary supplement containing creatine monohydrate in a convenient tablet form. Creatine is a chemical compound consisting of three amino acids: glycine, arginine and methionine, which a human body uses to create phosphocreatine. This, in turn, is the basic substrate for the formation of ATP (adenosine-5'-triphosphate), the basic energy carrier in the human body. ATP transfers its energy to various biochemical processes, i.a., to generate strength from our muscles. About 95% of creatine in the body is stored in the skeletal muscles in the form of phosphocreatine. The remaining 5% is stored in the brain, kidneys and liver. Increases energy – phosphocreatine reserves are depleted, among others, during physical exercises. The provision of its precursor, creatine, allows the body to quickly restore necessary reserves of ATP, which is the basic energy carrier. ATP transfers the chemical energy used for various processes throughout the body. The release of this energy (e.g., during muscle contraction) leads to the breakdown of ATP to ADP (adenosine-5'-diphosphate), which is inactive; therefore, creatine donates its phosphate group, enabling the reconstitution of ATP. This cycle occurs in the human body constantly. Every day, every person transforms the amount of ATP comparable to the mass of their body. Effectively increases strength and endurance of muscles – during short-term and high-intensity activities, such as lifting weights, the body first uses the metabolic pathway called ATP-PC. Such activities exhaust the creatine reserves in the muscles in just a few seconds of activity. The process occurs mainly in the muscles where creatine deposits are the largest, due to which we are able to generate more strength and regenerate faster. Creatine supplementation is recommended for both short-term, intensive activities and longer but less intensive ones. Builds muscle mass – creatine, especially in the form of monohydrate, causes an increase of water levels in muscle cells, that way providing more nutrients necessary for their growth and enabling the occurrence of many important processes (water is a necessary environmental factor for the occurrence of many key reactions). In addition, it has been shown that people who take creatine display an increase in the level of one of the most important hormones in the context of building muscle mass – IGF-1 (insulin-like growth factor-1). It stimulates the process of muscle protein synthesis. Prevents muscle catabolism – creatine supplementation reduces the activity of myostatin. It is a protein that limits excessive muscle growth. If the protein appears in excess, it can also promote the breakdown of muscle tissue. A high level of myostatin in elderly people is one of the causes of sarcopenia – the disappearance of muscle tissue. Creatine reserves are also found in the brain. Studies have shown that supplementation with creatine increases cognitive function, especially in people on vegan diets. In addition, human brain needs a lot of energy to support more efficient work. Therefore, creatine stored in the brain can be put to good use, just like in the muscles. Creatine in the brain functions also as an antioxidant, thus protecting the brain structures from free radicals. In conclusion, ACTIVLAB Creatine Tabs is the best studied form of creatine – monohydrate. Its activity has been proven numerous times. It is safe to use for both beginners and more advanced people. It effectively increases workout abilities, strength and muscle mass. Sorbitol, aroma, acidity regulator: citric acid, anti-caking agent: magnesium stearate, sweetener: sucralose.